After a long lunch, it was time once more to hit the road. This time to head for the sprawling metropole of London. We made good time until we hit the confines of “Greater” London and then I remembered everything I hated about driving in that huge car-trap. From then on things took twice as long as expected. There’s just too much traffic in London and too little space between the traffic lights. It wasn’t clogging up, just running slowly and of course the fact that in London there are four traffic lights for every person, or so it seems. It was a bit of a surprise as I was expecting the streets to be empty as everyone was in Brighton. Clearly the people heading to Brighton were not from South London. We had booked a hotel at the last minute, realising the folly of not staying in London for that night only once we had arrived in the country. We booked on lastminute.com. Actually we nearly didn’t book it as we were not given any details about where the hotel was exactly or what it was called until we had booked making it seem very dodgy. All we knew was its approximate location, cost, its facilities and the number of stars. Only upon coughing up the readies did its name and address get revealed. It turned out to be a 4-star student halls with rooms that were fully equipped if a little small. But as it was just somewhere to crash out, all it needed was a bed anyway, but you do get used to hotel rooms of being a certain size. In the time it took to check in and swoop the stuff up to the room and fly back down to put the car somewhere more legal, – a matter of a few minutes – a uniformed henchman of the local council had shot out of hiding on his motorbike and was already producing a written demand for money from his Fine-o-matic and had already added his α to it. 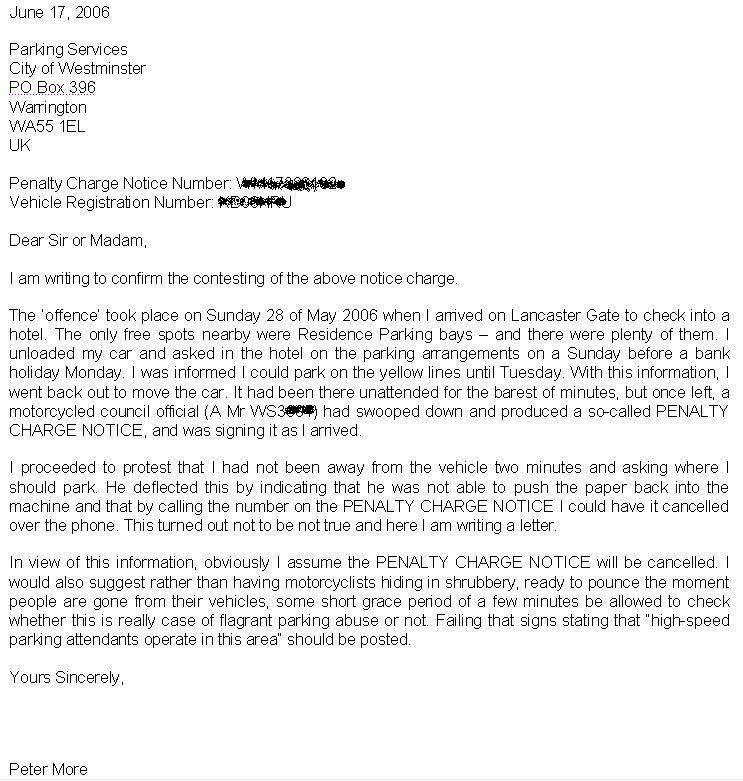 It took me a few seconds to realise he was producing the aforementioned ‘PENALTY CHARGE NOTICE’ for my vehicle which had been there for no time at all. He must have been hiding in the bushes just down the road or under a pebble. here. I’ll let you know if I hear back. I was somewhat annoyed by this incident, but didn’t really blame the hiding motorcycle guy. I know how those jobs work. The guy is paid per fine placed regardless of if they are overturned or not. So swooping out of the undergrowth to slap a fine on a car that is still warm makes sense to the guy than hanging around and seeing if this is really the car or a parking offender or not. The council, of course, sets the rules. They make them simple so they do not have to employ skilled traffic wardens with the patience and experience to assess the situation correctly rather than taking on kids with motorbikes who slap a ticket on anything that doesn’t move. I blame the “arms-length,” dumbed-down world we live in.